The Reliance Jio Happy New Year offer allows you get 1 GB mobile data limit on daily basis. Most of the Jio users looking tricks to increase the Jio speed after 1 GB. In this guide we have to discuss how to bypass Reliance Jio 4G 1 GB daily data limit. Reliance Jio Happy New Offer reduce the daily 4G data limit. The main reason behind that there is a big group of Jio users have to use less than 80% data limit in 1 GB data. In this offer you can easily get high speed 4G data speed up to 1 GB on daily basis. After crossing the limit of 1 GB your data speed will be reduced and you will get 128 Kbps speed. Most of the person who are crossing the 1 GB data limit on daily basis need to know how to increase or bypass Reliance Jio 4G 1 GB daily data limit. In this article we have to discuss few important five tricks which helps you to bypass Reliance Jio 4G 1 GB daily data limit on your device. If you already use Reliance Jio Happy New Year offer and want to get 4G high speed after crossing 1 GB data limit. Step 1: One by one remove or uninstall all Reliance Jio apps from your phone. Step 2: Download and install old version of MyJio and all related apps on your handset. Step 3: Close the internet connection from your phone and tap on the Get Jio Sim option. Again turn data on and tap on the skip button. After few seconds you will automatically logged in and Reliance Jio preview offer is activated on your phone. You have to remember one thing that after using this method there is no need to update MyJio app with new version. If you do this job that again your Happy New Year offer is activated on your handset. If you handset does not support this trick then you have to change IMEI number to any LYF mobile to resolve the issue. This is another important trick which allows you to use unlimited 4G data speed between 2:00 AM to 5:00 PM. This is an official offer which is not counted in daily 1 GB data limit. You can easily download movies, software, games and other required things during this period. To get the unlimited 4G high speed for 3 hours between 2:00 AM to 5:00 PM first turn off mobile data from your handset. Now turn on your mobile data before start the 3 hours period to get unlimited 4G data. Now, you can start the downloading in unlimited Reliance Jio 4G offer. This is third trick which allows you to bypass Reliance Jio 4G 1 GB daily data limit on your phone. You have to take take few given steps to do this jo on your handset. Step 1: Download any free VPN from Google Play Store which are using USA or Germany server. Step 2: Turn off the mobile data from your device. Step 3: Connect mobile data with joint Apn then connect the VPN which are using USA or Germany server. Step 1: Open the Settings option from your phone > Mobile Networks > Jio Sim > Create New Access Point. Step 2: Enter the required name and then enter the “JIONET” in APN. Step 3: Enter the given proxy – 202.88.241.12, set the port 80, Apn type – Default and Server – www.google.com. Now left other fields and save the settings on your phone. After that restart your phone and connect mobile data with the profile. Now, you can use unlimited Reliance Jio 4G high speed internet on your phone. There is no need to install MyJio app to your phone. Step 1: Tap on the Settings option > Mobile Networks > Set Apn with “JIOJET”, select the APN protocol at “ipv4/ipv6”. Now, left the blank remaining all the fields. Step 2: Set Reliance Jio data limit 700 MB out of 1GB. Step 3: Open the Youtube and download few videos. When you reach the limit up to 900 MB your downloading will be stopped automatically. You must have to tap resume button and you will get unlimited 4G speed. If your downloading does not start then you have to do following things. Step 4: Open the Apn setting and select the Apn protocol at “ipv6”. Step 5: Use 50-60 MB data and restart your device. Now, again change the protocol to “ipv4/ipv6” and resume the downloading. Now you easily bypass Reliance Jio 4G 1 GB daily data limit on your phone. 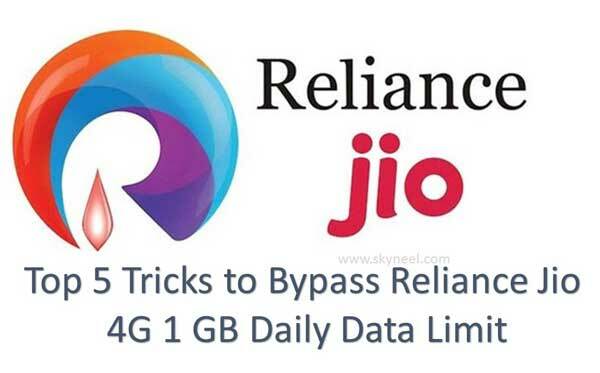 I hope given 5 tricks are helpful to bypass Reliance Jio 4G 1 GB daily data limit on your phone. If you have any query or suggestion regarding this article then write us in the comment box. Thanks to all. Do any of these methods have been tried by anyone and found useful? I have tried the 4th method and it didnt work.